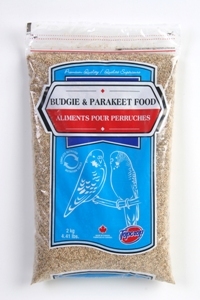 Topcrop Budgie & Parakeet Food has been formulated as a 100% complete and balanced diet for all domestic Budgies and Parakeets. Since your pet is a creature of habit, it is important to establish a constant location for the food cup, and only feed what will be consumed in a 24 hour period. Unlike many other pets, birds have virtually no body fat reserve, and will perish quickly if they go without food for even one day. Take care to clean out the food cup from all seed hulls each day when it is replenished. Always maintain a fresh supply of water that is accessible continuously. Should your pets food become contaminated with urine, droppings or water, discard the soiled food, wash out and dry the dish and replace with a fresh supply. Although supplementation is not necessary, you may want to occasionally give your Budgie or Parakeet a treat, such as a seed stick, or one of many other prepared treats on the market. Budgies and Parakeets have very individual dietary requirements and should only be fed food specifically formulated for them. Feeding food intended for other animals may result in severe health consequences. When taking your animal out of its habitat for any reason, never leave it unattended, as pets that get loose may suffer serious injuries.